The impact of the recent Deepwater Horizon oil spill will result in oil and gas pipeline installations coming under far greater scrutiny from industry regulators over the coming months and years. Dr Richard Gooch discusses how to meet these more stringent engineering, inspection and safety requirements. The impact of the Deepwater Horizon oil spill in the Gulf of Mexico will mean that oil and gas pipeline installations are likely to come under far greater scrutiny from industry regulators over the foreseeable future. In the short term, regulators are going to have to consider ways of putting additional controls in place, which oil companies and their contractors will have to introduce and then be measured against, in order to determine whether they are meeting their engineering, inspection and safety obligations. The key issue here is how the oil industry as a whole can minimise risk and ensure the safety of its personnel and the integrity of its drilling rigs and pipelines. Some of these regulations will relate to engineering specifications and inspection requirements, which are both likely to become increasingly stringent. This means that there should be a growing demand for services from independent inspection companies, who can offer the full range of pipe measurement and inspection services. 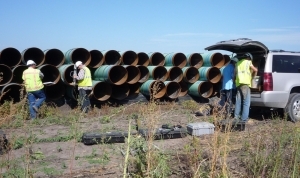 So what will pipeline installation contractors require? First, using the services of a third party, independent measurement and inspection company, which has the technical prowess and track record in oil and gas pipe inspection work will become even more important. It would also be useful if that same company has experience in resolving any disputes that may arise between suppliers, installers and operators, possibly in terms of engineering and inspection specifications. Some inspection companies also have experience in providing expert testimony and preparing supporting inspection documentation for legal court cases and disputes. The pipeline contractor is also likely to require very clear, concise and informative reports, detailing whether pipes are in or out of their manufacturing specifications, supported by photographic evidence if required. Other services required by pipeline contractors may include very specific inspection consultancy, including onsite inspection surveys. Expert advice and guidance may be required in terms of the effects of delivering better weld quality on pipes, as well as the benefits that would arise from improved engineering and the quarantining of any 'out-of-spec' pipes or parts. Independent inspection companies may also be asked to get involved in Pipe Reeling Trials, Weld Performance Qualification Tests (WPQTs), and Pipe Fatigue Trials, in order to help improve the engineering integrity and inspection of subsea structures. Finding an independent inspection company that can provide all of these services is not easy, but they do exist. In the offshore industry, contractors may require independent inspection of oil pipelines. 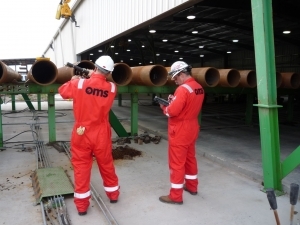 This may involve the inspection of pipe wall thickness to ascertain what proportion of pipes supplied are outside of their manufacturing specification. This type of work involves comprehensive, verifiable inspection of wall thicknesses. Identifying those pipes that are out of their specification tolerance means they can be quarantined and returned to the pipe supplier. On large, land-based pipelines, the pipes supplied can sometimes cause welding issues due to a variety of reasons such as bevel imperfections or welding defects. Independent inspection companies are therefore required to conduct multi-site surveys of pipeline spreads. Measurement data of pipe weld defects can be recorded and supporting photographic evidence gathered, including photographs of gauge measurement readings if necessary. Any defect discovered can be measured and recorded using alternative measuring devices/systems, in order to provide comprehensive, irrefutable evidence for legal disputes. Other supporting documentation may include operator details and tools used. Weld features measured can include a variety of parameters, including diameter variations, coating contamination of pipe ends, wall thickness, bevel angle, land thickness, squareness, pitting, excessive corrosion and whether any bevel damage (dents or gorges) was present. Following completion of independent inspection surveys, the proportion of pipes supplied that were out of specification can be reported to the pipeline contractor. In some cases, this has led to the pipeline contractor having to re-bevel all the out-of-tolerance pipes before work can continue. By providing inspection documentation, photographic evidence and expert testimony, independent inspection companies have been known to help pipeline contractors recoup multi-million pound settlement sums in disputes with their pipe supplier. For some pipeline contractors, surveys of pipe end dimensions may be required, particularly if a batch of incorrectly machined flowline pipes are discovered. The complete batch of pipes may have to brought back onshore for inspection. What is often required is some kind of sequencing exercise, whereby the independent inspection company advises the customer of the sequence that the pipes should be fitted up and welded, in order to meet the HI/LO specification for the project. In order to do this, the inspection company may have to use or develop custom measurement tools that provide irrefutable approach to pipe end dimensional inspection.